Silent Lights is an urban light installation located near the Navy Yard in Brooklyn. For the residents of northern Fort Greene, Brooklyn, the intersection of Park Avenue and Navy Street is a bleak and noisy place that is best avoided. The Brooklyn-Queens Expressway (BQE) runs directly above the semi-industrial landscape, bringing with it the ever-present roar of the 160,000 cars that traverse it daily, and throwing the pavement beneath into permanent shadow. We wanted to make this desolate urban landscape more inviting for locals and passersby. Silent Lights takes the Expressway’s ever-present traffic noise and makes it visible, illuminating the gloomy, clamorous underpass with a pathway of peaceful lighted gates. The lights respond to the sounds above them, lighting up sequentially as vehicles pass overhead. The hum of the traffic thus becomes a tangible, reactive presence rather than a hidden aggravation, and passersby can walk beneath the multicolored gates to experience a moment of respite from the constant noise. The installation also acts as a way-finding element, making the inconspicuous pedestrian pathway more visible and engaging. 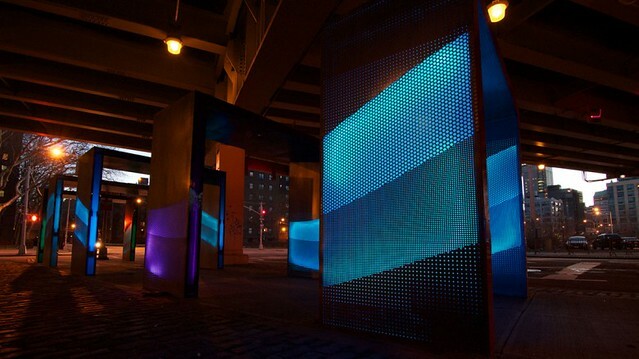 The installation consists of 5 multicolored gates that light up sequentially in response to ambient noise. The gates are made of various perforated metal panels clad over an aluminum frame. Each gate contains 2 sealed white acrylic boxes; these boxes house the sequence of LEDs. In total, Silent Lights is embedded with 2400 LEDs and 2 microphones, controlled by an arduino mega microcontroller. Silent Lights was created in partnership with the Urban Arts Program of the Department of Transportation and the Brooklyn Arts Council. The project also received generous support from Artplace America, Black Rock Foundation, Designers Lighting Forum of New York, Awesome Foundation, and individual donors. In 2012 we held a fundraising event to raise additional funding for the project. Generous donations were made by family, friends, and the local Brooklyn community to make this project a reality.